In a highly unusual move, four senior members of President Rouhani’s cabinet have written a letter to the Iranian president expressing deep concerns over continued economic recession and the risks of an upcoming economic crisis in the country. 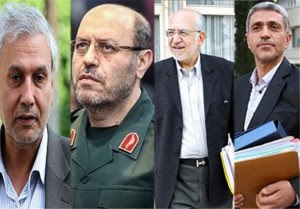 Ali Taeb-Nia, Minister of Economy and Finance; Ali Rabii, Minister of Labor; Mohammad Reza Nemat-Zadeh, Minister of Industries; and Gen. Hossein Dehqan, Minister of Defense, signed the letter, which was reported by the Iranian news agencies Mehr and ILNA on Sunday. In the letter, dated 9 September 2015, the ministers point to the near meltdown of Tehran Stock Exchange (TSE), writing that TSE has lost 42 percent of its value since January 2013, with major publicly-traded companies losing some $55 billion of their values. The ministers also point to falling oil prices and other minerals. They warn that if the government does not take immediate actions, the Iranian economy could soon face a crisis, which would take years to come out of it. the central bank has to lower the interest rate, in order to flow capital to amrket. the iranian accumulate their money in banks and donor more invest. few days later , 4 key minister warn of crisis because of 2 years recession. a communication disaster for Government. So there is no miraculous recovery after President Ahmadinejad's departure ??? After lifting of some the sanctions , we should see considerable growth in the Iranian economy .Iran has a lot of sophisticated people and find its rightful place in the community of responsible nations in due time.Its people are only hampered by the out dated theocracy that is stunting that country's development . Iranian economy has been mismanaged for decades following the revolution and will continue to be so for foreseeable future . The letter mentioned above shows jockeying of several factions within Iranian for their share of the upcoming billions of unfrozen assets . It's a shame that some of those unfrozen funds will find their way to some of the worst factions in Iran and their terrorist allies . nobody should wait too much from Iran. For me it is safer to invest in a 20% saving account than invest in an industrial project. The chicken and egg problem of needed cash to invest in industry and economy is something that can only be resolved by government correct planning and borrowing. When the inflation is reduced and interest rates are lowered and legal obstacles are removed then investing in projects becomes feasible and profitable and this problem is a circle that needs aa lot of energy to be broken and corrected. The energy is extra funds and correct planning which they do not have. The fact that a government needs to write to himself to complain about his own plans shows that that government not really at charge or it is under other pressures that it needs public support. Only in Iranian style government and Iranian culture you see a Drama is needed on behalf of the responsible party to solve its own problem. That is also a cultural issue on the highest level which works against the Iranian economical revival! Please expand on the " cultural issue" and " Iranian style government " and "chicken and egg " concepts and their correlation with complex economical issues of a developing country such as Iran .I hope you don't get your economics clues from modern day snake oil salesmen . So the nuclear negotiations were not the only things the donkeys are supposed to be good at .